Enter a world where anything is possible in KeyForge! Here in the world�s first Unique Deck Game, two players become Archons racing to forge keys that unlock the hidden vaults of the Crucible, an artificial world built from pieces of countless planets. With an incredible array of creatures, artifacts, and abilities, no two decks are alike, and no two battles will ever be the same! 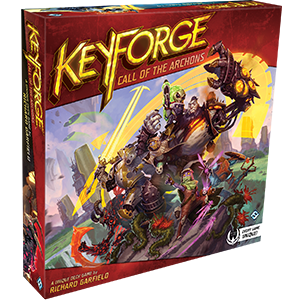 The Keyforge: Call of the Archons starter set is the perfect place to begin your adventures on the Crucible. As you race to gather �mber and unlock the Crucible�s hidden vaults, you need to all the help you can get, and in this set you will find all the implements you need to begin your journey. Providing you with two training decks: Miss �Onyx� Censorius and Radiant Argus the Supreme, as well as two unique Archon Decks and a collection of keys, tokens, chain trackers, and status cards, this set provides you with everything that you and your chosen opponent need to start playing! Playing with the starter set is only the beginning of your adventures. You can expand your arsenal with Call of the Archons Archon Decks, each of which offers a full play experience without the need for deckbuilding or boosters. Each Archon Deck is completely one-of-a-kind, unlike any other deck in existence, and it offers an opportunity�the chance to become the best in the world at playing your decks. Will your teams have the strength, skills, and cunning to win the day? The world of the Crucible awaits! KeyForge is a Unique Deck Game from the imagination of Richard Garfield that invites you to enter the Crucible, an artificial world where anything is possible. Here, you become a mighty Archon racing to unlock the Crucible�s hidden vaults and doing battle with one-of-a-kind decks, each filled with pieces of the countless planets and civilizations that make up this world. By using the creatures, artifacts, and abilities within your deck, you can stave off your opponent, gather �mber, and use this crucial component to forge keys that will unlock the vaults. The first Archon to forge three keys earns victory! When two Archons discover one of the Crucible�s hidden vaults, conflict is bound to erupt. Each side sends their fiercest warriors into battle while others race to gather the precious �mber. When the tide can turn at any moment, balance is key! KeyForge offers easy to learn, fast-paced gameplay with completely unique decks, each deck unlike any other KeyForge deck in existence. Every deck invites you to embody a totally distinct Archon, displayed on the back of every card in the deck with their own unique name and design. Your deck also contains a distinct mix of creatures, artifacts, and abilities from three of the Crucible�s seven Houses! Each Archon Deck offers a complete play experience, and the deck cannot be changed through deckbuilding, challenging you to make tactical decisions and discover the synergies within each deck. The unique mix of cards and Houses in each deck makes mastering every new play style and combination of Houses a thrilling challenge for every new deck you encounter. As you are thrown into battles where the tides can change at any moment, you are immersed in your role as the leader of your alliance to experience a game unlike anything you�ve ever seen. To achieve victory, you will need to call upon the skills of every House within your Archon Deck. Each House features an incredible array of beings with their own culture and technology, now incorporated into the Crucible. At the beginning of each turn, you must make the tough, tactical decision of declaring which House you will play that turn�and for that turn, you are only allowed to play, fight, and reap �mber with cards from that faction. The boisterous warriors of Brobnar value strength above all, while the corrupted demons of Dis rely on sorcery and dark machines. The logical scholars of Logos bring technology into every phase of their lives, but the diverse creatures of Untamed find comfort in the wilds, rejecting automation. The empire of Mars has remained intact on the Crucible, while the cunning rogues of the Shadows faction have fully embraced their new home, seizing every opportunity to pull a job or swindle another House. And the angelic members of Sanctum seek the same enlightenment as their Archons, valuing peace and virtue above the conflict that runs rampant throughout the Crucible. Now, each of these uniquely strong Houses must struggle alongside unlikely comrades and strange companions to aid their Archon� but which alliances will be powerful enough to achieve victory?